YOUR PRINT SOLUTION, based in High Wycombe, UK, have recently installed a Kluge EHD Foil Stamping, Embossing and Die Cutting Platen Press. The press was fully remanufactured at the Kluge facility in St Croix Falls, Wisconsin, USA and delivered with Adjustable Impression – an optional feature which decreases make-ready time and allows the impression to be infinitely adjusted with the simple turn of a handle. Desgined to accommodate sheets up to 17”x24.75” (431mmx628mm) with up to 40 square inches of die area, the Kluge EHD is known for providing years of reliable service and is well established within the industry as the standard by which all presses in its class are measured. Established in 2006 by Steven Brown and David Jackson, Your Print Solution brought together both Brown’s and Jackson’s respective expertise. 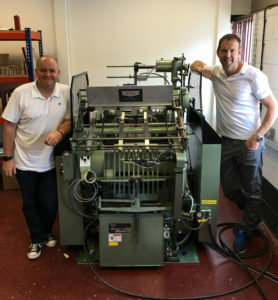 The pair originally met at college in 1984 and spent the following 18 years independently building their skills and growing their proficiency within big name print companies. Between them, they have many decades of knowledge and experience covering the full range of print services, from design and artwork, to colour reprographics and marketing. Today, Your Print Solution employs 19 people and specialises in developing Web2print, Marketing Portals, and all forms of digital print using HP Indigo technology. Your Print Solution can boast many high profile clients including YMCA, 20th Century Fox and EuroCar Parts, to name just a few. Kluge International (part of AeTee Limited) operates as the UK and International Sales and Support arm of Brandtjen & Kluge Inc., a US manufacturer of reliable, high quality print finishing equipment. Kluge International is responsible for sales of machines, spare parts and service for all international customers outside of North America. The Kluge line of equipment includes foil stamping, embossing and die cutting platen presses, and multi-function and high-speed straight-line folding and gluing equipment. All Kluge equipment comes with approved CE guarding, installation, training, and full warranty. AeTee Limited also offers other print finishing equipment including Eagle Cold Foil Systems, Straub Tape Systems and Tape Applicators, and Insignia Rotary Die Cutters.